Have you ever wondered, “What is a negligent tort?” Here’s the short answer: it’s a civil lawsuit based on the legal theory of negligence. 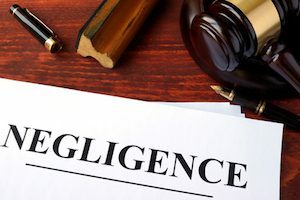 And if you’re curious about what “negligence,” means in the legal realm, it refers to a wrongful act that is not deliberate, but where someone has failed to act a certain way. We’ll explain this in more depth below. Seems pretty simple, but what exactly do these things mean? Duty refers to an obligation or conduct expected of someone. If they don’t perform the obligation or have improper conduct and someone gets hurt, they may be legally liable for not meeting this duty. Let’s look at a few examples. A medical doctor has a duty to provide competent medical care to his or her patients. Anyone driving on the public roads has a duty to drive in a safe manner and follow all traffic laws and rules. A store owner has a duty to keep the store premises in reasonably safe condition for the shoppers who may come inside the store. A breach of duty means someone did not meet the obligations required. Using the above examples, a medical doctor would be in breach of duty by leaving a scalpel inside a patient after surgery. A driver would be in breach of duty by running a red light. A store owner would be in breach of duty if the store owner didn’t remove standing water (within a reasonable amount of time) that was present on the store floor. For liability to exist for negligence, the breach of duty must cause harm to the individual. So the doctor leaving a scalpel inside a patient must cause harm to the patient, a driver running the red light must cause an accident and the standing water inside a store must be responsible for causing someone to slip and fall. Even if there is causation, there isn’t necessarily legal liability if damages do not exist. In the medical doctor example, there are clear damages. Even in the unlikely event the scalpel doesn’t cause any harm to the patient’s internal organs, further surgery is still required to remove the scalpel. This extra surgery would constitute damages. As for the driver running the red light, there are clear damages since the breach of duty caused a car accident. At the very least, there will be property damages to a vehicle. But in the store owner example, if someone were to slip and fall on standing water and be perfectly fine after the fall, they wouldn’t have a claim for negligence because they would have no damages, such as broken bones. If you’re still wondering, “what is a negligent tort?” and believe you might have a lawsuit for one, contact our legal team at Williams & Williams, LLC by calling 770-823-2711.